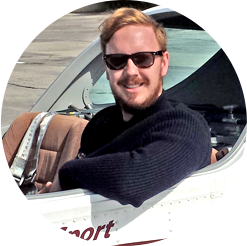 Having left Ampleforth College in 2006, Charles Thomson founded Santa Monica Flyers in 2009. From the outset, the goal of the business was to make flying accessible, safe, affordable and fun. The selection of the Sportcruiser was instrumental in realizing that goal, and from a single airplane in 2009, the business has grown to four Sportcruiser aircraft today. During this time, the school has graduated dozens of students from both Sport Pilot and Private Pilot courses. I'm a 27 year old Scottish native who moved to LA at 18 and started Santa Monica Flyers when I was 20. My older brother taught me to fly. I started Santa Monica Flyers after being in a plane crash while attending a different school on the field. I though that flight schools should be using newer safer airplanes whilst charging less thus making flying both safer and more affordable to the average person.